Mind Reader. Cult Leader. Dave. 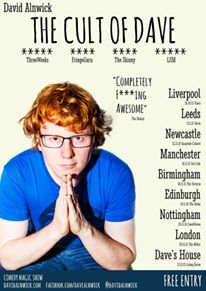 David Alnwick takes his critically acclaimed magic show on tour, gathering new followers in order to fulfill his childhood dream of becoming the leader of his own cult. Employing practical, real world examples of ‘social manipulation’, Dave will entertain, excite and inspire. Come and worship at the feet of your new lord and commander. After the performance Dave will give a 30 minute talk on the ideas and techniques employed within the show including some mention on the wider psychology in play, followed by a question and answer session. This entry was posted on October 2, 2015, 12:36 and is filed under Skeptics in the Pub. You can follow any responses to this entry through RSS 2.0. You can skip to the end and leave a response. Pinging is currently not allowed.